Great job merging these kits! Your photo is fabulous. Lovely composition. I love the way you did your title. Great photo and layering! I love how everything seems to be falling off this page with the way that you angled everything and your title ever so slightly moving down the layout! Beautiful layout! Thank you for scraplifting one of mine! pretty! I love your fun title! That photo is so serene and your title work is lovely! There really is something about winter quiet, isn't there.... so peaceful! I love the artsy feel to your page and the way you have angled the photo and paper. That's an awesome photo too! Awesome title work and love all the stamping. Lovely page! This is so pretty, and I'm going to echo what everyone else said - I LOVE the titlework!! 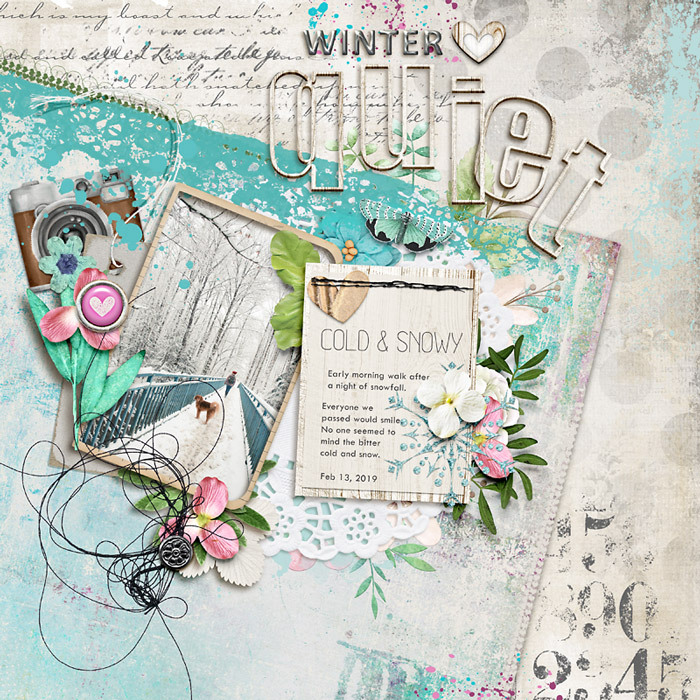 Wow...what a gorgeous wintery, serene picture you've painted with this page! That photo is so lovely, and like all the others have said, your title work rocks! I love the title on this and the photo is just gorgeous! i love the winter-y feeling of this kit, so cool!